Malia is a large and very popular seaside resort in Crete, situated 40km from the city of Heraklion. It is the tourist Mecca of Crete, mostly visited by British youngsters who are attracted by the wild nightlife and the sense of freedom offered in this nice place. Malia is a well organized and appointed place, ideal for tourists, as there is pretty much everything a tourist might want. Shops, gift stores, bars, clubs, restaurants and tavernas catering local and international cuisine, organized beaches with sun beds and umbrellas or any other means of entertainment exist here in abundance. Internet cafés, amusement places and a vast array of water sports can be found in the area as well. 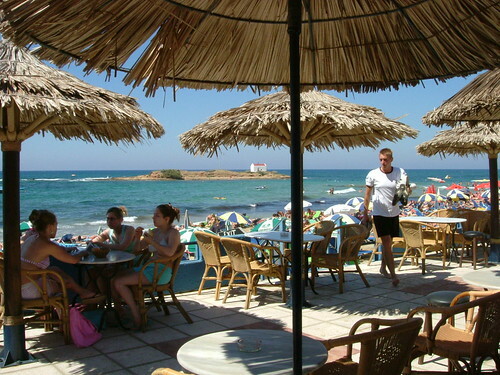 Malia features a very nice sandy beach, with taverns all along. Malia is not a place for families or for people who want to enjoy calm and relaxing holidays. As British tourists dominate here, the tourist industry of the area is set to meet their needs. The entire village can be quite noisy at night and early morning hours, as the youngsters return to their hotels after drinking all night long. However Malia is not known only for its touristic development and present. The Palace of Malia, situated East of Heraklion, was the third largest palace in Crete after Knossos and Phaistos, laying at 7,500 sq meters. Today the Palace and its premises compound a large archaeological site, open to the public. It is a very popular destination for people who are interested in the long and rich history of this much known tourist resort. If you are planning to visit Malia in summer, make sure that you make a reservation early enough; tourist agencies book a large number of rooms for the British tourists. You can also check one of the Heraklion car hire options in order to rent a car and drive safely and comfortably to all major sites in Heraklion and close to Malia.